Flipkart promotes Samsung Galaxy S6 edge, asks "What's Next?" Indian online retailer Flipkart has started promoting the Samsung Galaxy S6 edge on social media. The image of the Galaxy S6 edge used shows the handset lying sideways against a black background. 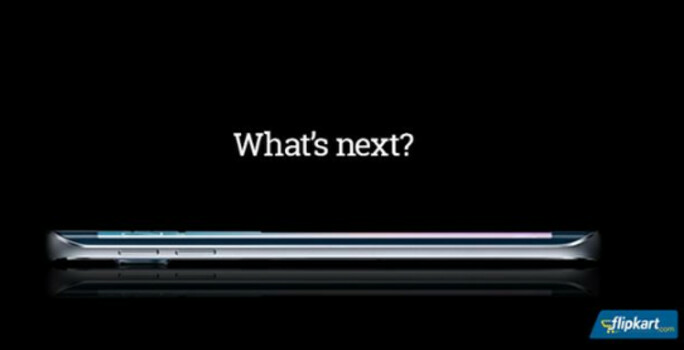 On the top of the picture, in white letters, the question "What's Next?" is printed. The Flipkart logo appears on the bottom right corner of the picture. Both the Samsung Galaxy S6 and Samsung Galaxy S6 edge are expected to be released in India on April 10th. Based on pricing leaks in other countries, we should see the former priced at the equivalent of $800 USD with the latter priced at the equivalent of $960 USD. In the U.S., we could see Best Buy start accepting pre-orders for both models on March 27th, as we informed you yesterday. Verizon has already announced that it will start taking reservations for the Galaxy S6 and Galaxy S6 edge on April 1st. I love the look of this phone, but I really feel more at ease with a phablet. Hence my purchase of a Note 4, which is the most awesome phone I have ever used. please stop using the word "phablet". When you stop existing sure. Next generation Samsung wearable maybe? As a happy Note 4 user, I really love to purchase the S6 Edge and try a smaller screen. The only thing making me think twice is the glass back. I understand why Samsung used glass to make wireless charging possible, but I imagine it will be a fingerprint magnet which I would really hate. This is the reason I might wait for the Note 5. I hope samsung would use a premium back for the Note 5, but not glass. I am sorry for isheeps they can't afford a Galaxy S6, they are low level and poor, live pay check by pay check always on contract $199 or $99 with 2 years plan and they think they cool by holding an iphone. In my case, I don't need plan in any carries if I can pay full amount of the price of my iPhone 6. iPhone 6 still expensive than the Samsung Galaxy S6 here in Middle East.